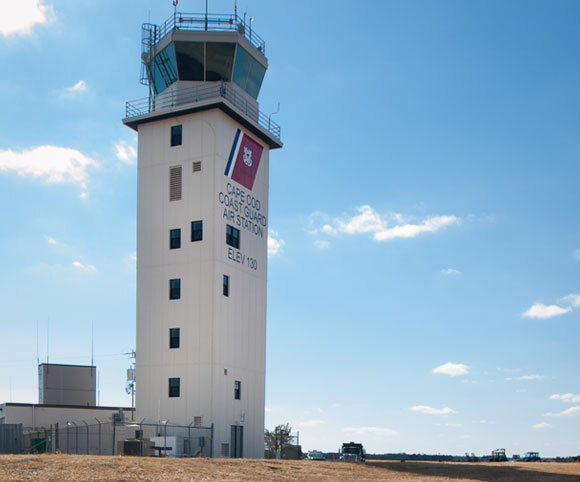 Gran Kriegel first evaluated the control tower at Air Station Cape Cod at Bourne, MA to identify, prioritize, and design needed repairs. Construction documents addressed overall life safety, egress, elevator replacement, concrete catwalk repairs; window, roof, railing, and galvanized steel siding repair / replacement; and MEP upgrades. We also provided construction administration. As a follow-up project in 2014, we are addressing OSHA-mandated changes to improve building safety. Since compliance with the current code is not feasible, we are designing engineering equivalencies. The current scope includes removing all fuel burning equipment to a new, remote building; constructing new rated walls and ceilings; relocating services out of the stairwell; and installing fire curtains at the elevator doors. Supplemental cooling is also being installed.